The first photographic process — heliography — was invented around 1824 by Nicéphore Niépce. Images were obtained with bitumen of Judea spread on a silver plate after an exposure time of several days. 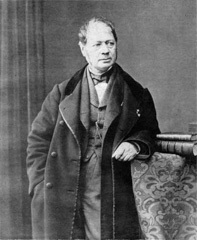 In 1829, Niépce associated Louis Jacques Mandé Daguerre to his research. In 1832, they put the last touches, using a residue of lavender oil distillation, by means of a second process producing images in a one day exposure time. 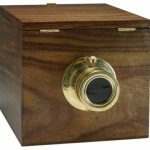 In 1833, Niépce died, and Daguerre invented, in 1838, on his own the daguerreotype, the first process including a development stage. A silver plate coated with a very thin silver iodide layer was exposed in a camera obscura, then exposed to mercury vapors that induced the apparition of the invisible latent image that had been formed during the exposure to light. This development was in fact such an amplification of the effect of light that the exposure time was hardly more than 30 minutes. Fixing was done by immersing the plate in sea salted water. 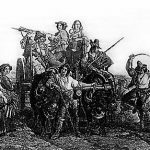 In July 1839, another Frenchman, Hippolyte Bayard, discovered the way to obtain positive images directly on paper. A sheet of paper covered with silver chloride was blackened by light, then exposed in a camera obscura after having been sensitized in silver iodide. The exposure time was from 30 minutes to 2 hours. 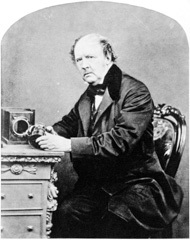 Still in 1839 , the announcement of the daguerreotype invention incited an Englishman, William Henry Fox Talbot, to resume interrupted research, the beginning of which was in 1834. 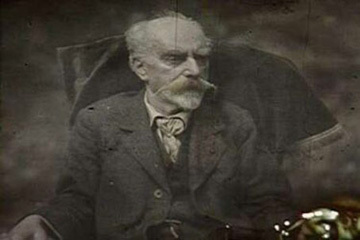 In 1841, he patented the calotype, the first negative-positive process that made it possible to multiply the same image, by means of an intermediate negative on a silver chloride paper made translucid with wax. 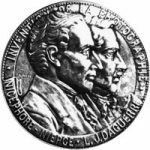 As for the daguerreotype, the latent image was developed by a chemical agent, the developer: a solution of gallic acid and silver nitate. A second sheet of paper also covered with silver chloride was then exposed through the translucid negative, to give the final positive. 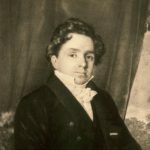 We owe to John Herschell the discovery, in 1839, of the way to fix images by dipping them in a sodium hyposulfite bath, which is still used today as the main component of photographic fix-baths. The main advantages of the calotype were the easiness with which one could manipulate the paper prints and the possibility of multi-printing. On the other hand, the sharpness, limited by the fibers in the negative paper, could not compete with the daguerreotype. To reduce further the exposure time , short focal lenses were created , letting more light in the camera , however keeping the sharpness on the whole image . 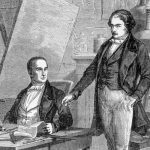 In 1841 , the physicist Fizeau replaced silver iodide by silver bromide, the sensibility of which to light was far superior . 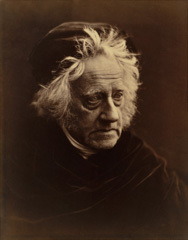 Time exposures of barely a few seconds were needed to obtain a daguerreotype and so it became possible to do portraits. 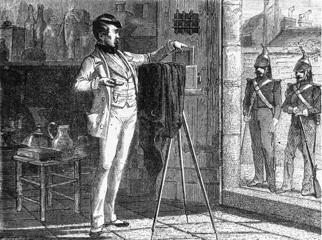 To improve the calotype negative transparency, Abel Niépce de Saint-Victor had the idea, in 1847, to replace paper with glass. So that the silver bromide adhered to glass, he mixed it with albumen (egg white). Even though a bit too contrasty, the images then became much sharper, forcing opticians to work on higher definition lenses. In 1851, an Englishman named Scott Archer replaced albumen by collodion, the base of which is gun-cotton (cellulose nitrate). The black and white images obtained with this process reached a quality unknown until then. The only drawbacks were that the picture had to be taken while the collodion on the plate was still humid and the developement had to happen immediatly after the exposure. 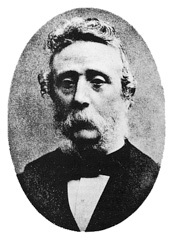 In 1871, another Englishman, Richard Meaddox, resolved this problem by replacing collodion by gelatin, a process perfected by Charles Bennet, who demonstrated that gelatinized plates acquired a high sensitivity when they were kept for a few days at 32° Celsius. Not only could the gelatino-bromide plates be stored before use, but their sensitivity was such that the exposure time could not exceed a fraction of a second. The story of the shutter started shortly before 1880, because the high sensitivity of these plates made it necessary to conceive mecanisms able to let light enter the camera for 1/100th and even 1/1000th of a second. It became necessary to precisely evaluate light intensity, and the light meter then became a real measuring device. 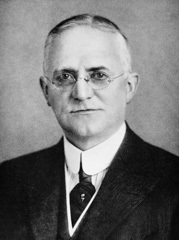 The American George Eastman, Kodak founder, conceived, in 1888, the idea of the supple base. Glass plates were progressively replaced by celluloid rolls. Photography was still missing color reproduction. The first tries were due to Edmond Becquerel in 1848. In 1851, Niépce de St-Victor showed that a silver plate coated with a layer of pure silver chloride reproduced colors directly, but in an unstable manner. In 1869, Louis Ducos du Hauron, in Agen, made the first color photograph applying the principle demonstrated by Maxwell of light decomposition in three primary colors: red, yellow and blue. He made three photos of the same subject, each of them through a different filter: a red, a yellow, and a blue one. He obtained three positives that he dyed with the color corresponding to each filter. By superimposing in register the three images, he got the restitution of the colors. The physicist Gabriel Lippman received the Nobel prize in 1906 for having found in 1891 a way to obtain photos in direct colors on one plate, by an interferencial process prefiguring Holography. Too complicated, this invention remained only a laboratory feat. The first monoplate color process practicable by amateurs was created in 1906. The autochrome plate invented by the Lumière brothers was based upon the principle of the trichromatic synthesis, realized on only one plate by joining to it a mosaic of microfilters in the primary colors realized with minuscule colored grains of potatoe starch. The discovery by R. Fisher around 1911 of the chromogene developer gave color photography a new direction. It had been noticed that some developers gave images with one color instead of black and white. 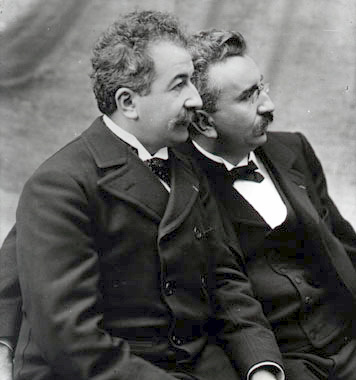 The brothers Auguste Lumière (1862-1954) and Louis Lumière (1864-1948). The trichromatic principle was used by Agfa to realize in 1936 Agfacolor films, made of three superimposed layers, respectively sensitive to blue, green and red. A developer that colored every layer into a color of its sensitivity was invented. The superimposition gave an image in color. The possibility of color reproduction led to improvements in lens manufacturing to transmit acurately the colors of the subject to the film. In 1935, two Americans, L . Mannes and L . Godowsky, improved this process. Bought by Kodak, it was named Kodachrome. If today’s color films are much more sophisticated, they still use silver bromide, gelatin and basic principles from Agfacolor and Kodachrome.